Our mission as members of the Junior Chaplaincy is to help the children in all classes meet God in liturgies, prayer, people and action. The season of Lent begins on Ash Wednesday, which this year was on 6th March. Lent is a season of preparation, when we are invited to change our lives so we can experience fully the joy of Easter. Traditionally, Christians make an effort during Lent to pray more, to give something up or fast and to give money to people in need. This year at St George’s School we are adding another action – Care for Creation. We hope that our Lenten activities will complement what you may already be doing at home. As Junior Chaplains we are going to support children during Lent in class liturgies, assemblies and their Lenten journey. Children who chose to pray more have received the yellow wrist bands and will use Prayer Journey weekly. We have also set up Lenten prayer stations around the school. 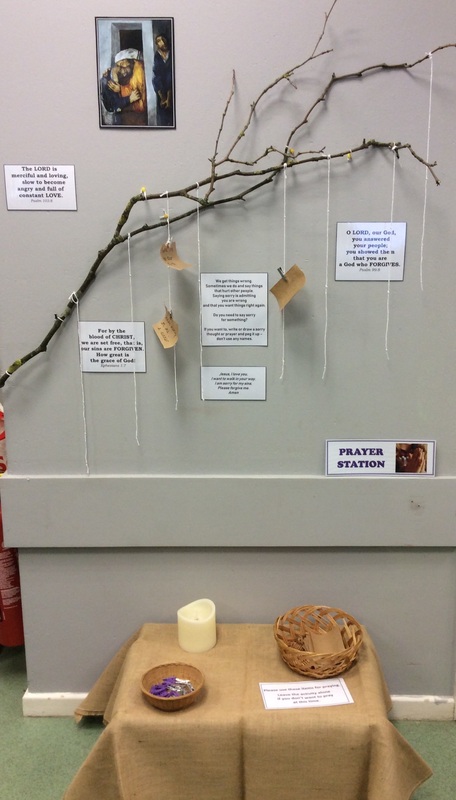 They are designed to give pupils and staff the opportunity to pray in different creative ways. 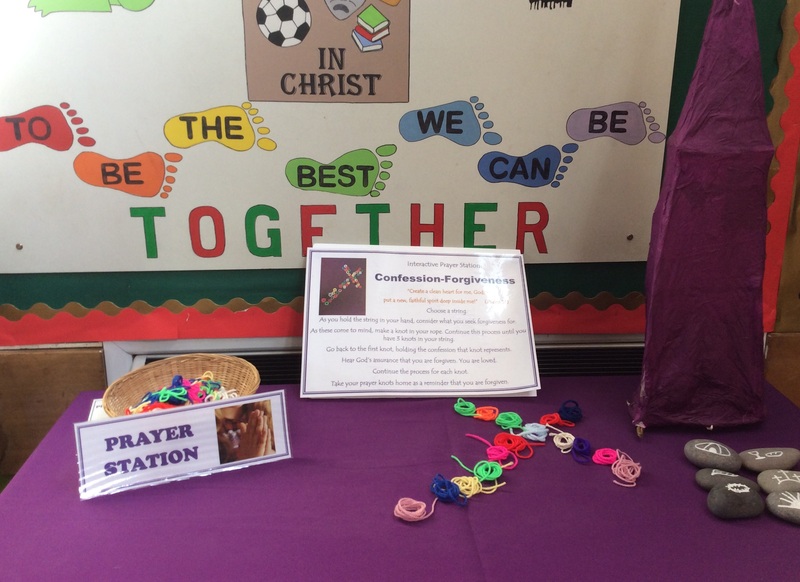 The first three active prayer stations are Forgiveness (in the Hall) and Wilderness ( near the staff room) and the Sorry String in Y5/Y6 shared area. Children who decided to fast (giving up things they like) have received the purple wrist bands. Every child in school has been encouraged to support CAFOD’s Give it Up Challenge this Lent. They received a collection box for any coins – either spare change or money saved by giving up something. Even the smallest coins will make a big difference when we collect them all together. Everybody in school-children and adults – will make an effort this Lent to reduce what we use and not waste resources, to reuse things and to recycle. We will be caring for our natural surroundings at school and where we live. We went to church on Wednesday 6th March for Mass where we all received ashes. Bishop Terry Drainey will be visiting school on Wednesday 13th March. He will join us for celebration, visit each class and bless our new nursery. 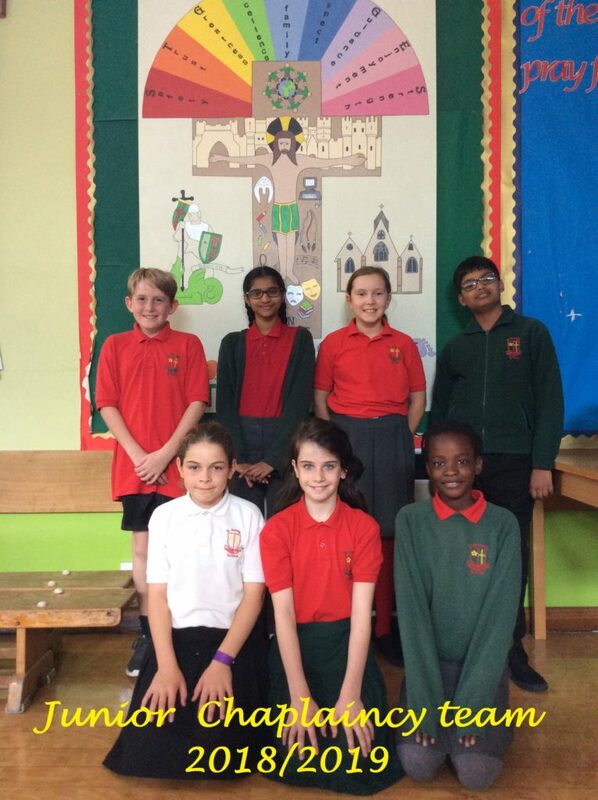 We welcomed our new pupils and staff in September and talked about the role of Junior Chaplaincy members and our plans for the coming year. We prayed the rosary in lots of different ways in October – traditional, colouring, walking, using art and music and, our favourite, eating! We have also run some lunch time club during which the children were making a decade of the rosary using some wooden and plastic beads and the pipe cleaners. We were invited by the SVP to welcome their guests at the Mass for the Sick at St George’s Church and help them with refreshments. Altar servers received training from Canon Alan so they can serve at school Masses. In November, we used special prayer cards to remember and pray for family members and friends who have died. This Advent, our Holy Family figures travelled around school, visiting every class, helping us to reflect on God coming to this world as a baby and what this means for us. For the first time, they also went to the homes of several pupils. We have also made some Christmas cards for the parishioners who will be visited by the members of the SVP at St George’s Church over the holiday. We encouraged the whole school community to join us in helping disadvantaged people in York by donating items for Christmas gift bags to be made by Kitchen for Everyone.